Wolverhampton Business Champions visited the House of Commons in London recently to discuss Black Country business. 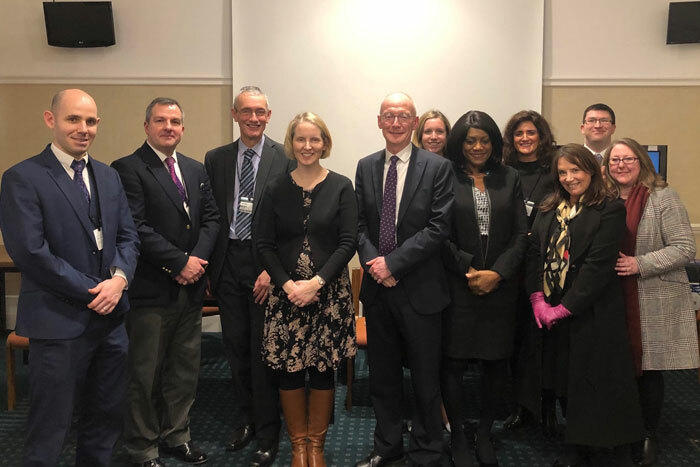 The Champions met with the Secretary of State for Business, Energy and Industrial Strategy, Greg Clark MP, as well as local Wolverhampton MPs, Emma Reynolds, Pat McCarthy and Eleanor Smith. Discussions took place around the long-term strategy for diesel and the automotive industry led by Trevor Leeks; the position and supply of workers from the European Union after Brexit led by Phil Barnett; and congestion and how it impacts on the economy of the Black Country and the wider West Midlands led by Caoire Blakemore. David Preece (Partner – FBC Manby Bowdler), Ian Palin (Senior Director – Quality & ACE, Actuation Systems, Collins Aerospace), Phil Barnett (representing Marston’s PLC/Grand Theatre), Emma Reynolds MP, Pat McCarthy MP, Caoire Blakemore (Commercial Director – AF Blakemore), Eleanor Smith MP, Claire Marshall (Chief Executive – Compton Care), Terry Gibson (Development Manager – University of Wolverhampton Alumni Team), Vicky Green (Head of Locality – Black Country, Bromford Group) and Bernadette Leo (PA to Ian Oakes, Deputy Vice-Chancellor at the University of Wolverhampton).